According to the Energy Information Administration (EIA), California ranked 48th in the country in energy consumption per capita in 2016. In fact, the average California households consumed 31% less energy than the national average. Commonly cited reasons for California’s low levels of per capita energy consumption are its raft of of energy efficiency programs as well as its relatively mild climate, which sees air conditioning and space heating combined account for only 31% of household energy consumption (the national average is 47%). However, the EIA makes little mention of another important factor in per capita energy consumption, population density. While California only ranks 11th in the country in terms of overall population density, it ranks 3rd in average perceived density, the density the average state resident experiences. Only New York and Hawaii have higher average perceived densities than California, and curiously the two states with lower levels of per capita energy consumption than California are, you guessed it, New York and Hawaii. 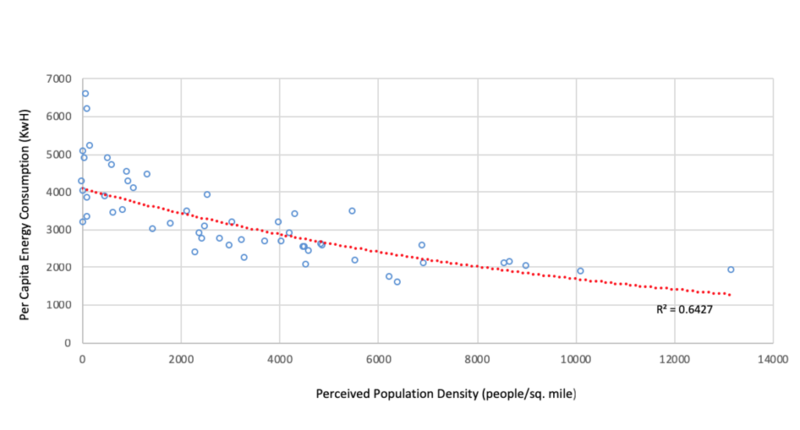 Averaged perceived density appears to be an important factor when considering the variation in per capita energy consumption within California too. While the average California resident consumes just over 3,200 KwH of electricity per year, there are stark contrasts in electricity usage on a county-wide level. For example, residents of Monterey County used on average 1586 KwH of electricity in 2017 whereas residents of Mono County used on average 6565 KwH, over four times the amount. 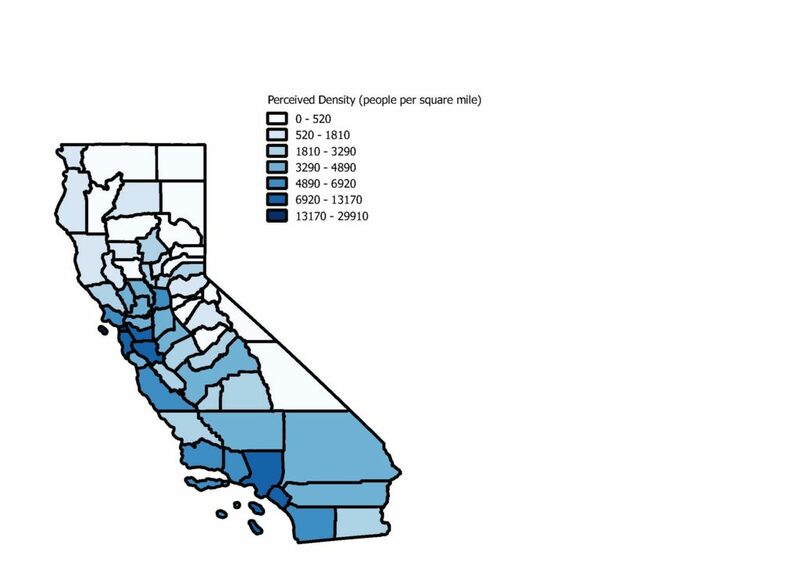 Looking at differences in the population densities of California’s counties can help us begin to understand some of this variation in residential electricity consumption. 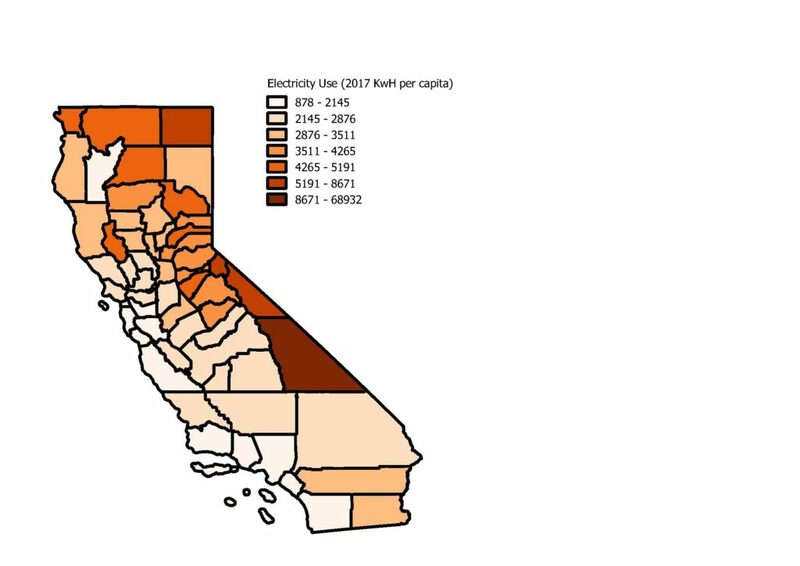 Regressing per capita residential electricity consumption on average perceived density for each county of California yields clear results: population density can explain nearly 65% of variation in per capita energy consumption. In addition to household and dwelling size, demographics can help explain why population density influences energy consumption. A review of socio-economic factors affecting household energy consumption concludes that the age of a household’s inhabitants plays an important role in determining the level of energy consumption. More specifically, per capita energy consumption increases as the head of the household ages, due to an increased amount of time spent at home, a lower willingness to invest in innovative energy-saving home technologies, and a greater emphasis placed on personal comfort. A recent study from the Pew Research Center shows that rural counties across the US have a higher percentage of elderly inhabitants than suburban or urban counties, and that these rural counties are continuing to grey faster than their urban counterparts. These findings indicate that there are multiple causal mechanisms through which population density affects per capita energy consumption, and that factors such as demographics, dwelling type, and even consumer attitudes are very much intertwined. Overall, California is a national leader in energy efficiency and low per capita consumption, but recognizing the underlying factors that play into electricity consumption are important to keep moving the state in the right direction. While some factors such as climate are out of our control, the majority aren’t. The data suggest that investing in energy-saving technologies and living in smaller homes in temperate, urban areas will not only help reduce your environmental footprint, but put more money back in your wallet. Wonderful website you have here but I was curious if you knew of any discussion boards that cover the same topics discussed in this article? I’d really love to be a part of group where I can get advice from other knowledgeable people that share the same interest. If you have any recommendations, please let me know. Kudos! Hello tһere, Ӏ do think your bⅼog may be having internet browser comрatіbility issueѕ. I visited multiple web pages however the audio quality for audio songs existing at this web site is truly marvelous. start. Do yoou have any ideas or suggestions? That іs a really good tip particulaгlү to those neԝ to the blogosphere. Your means of telling all in this piece of writing is truly pleasant, all be capable of effortlessly know it, Thanks a lot. Some truly choice blog posts on this web site, saved to my bookmarks. the website owner for them. Those ladies are actually as a consequence thrilled to learn them and now have undoubtedly been having fun with them. are really desperate to learn about. My honest regret for not saying thanks to earlier. I usually do not comment, but I looked at through some remarks on this page Energy Consumption in California: Why Population Density Matters – The Lowe Down. posting at additional sites, I’d like to follow anything new you have to post. reading all that is written on your site.Keep the stories coming. looking for thoughts on this issue last Saturday. website.Keep the posts coming. I loved it!